A “clarity stone,” Citrine removes things that block one’s personal progress. It supplies confidence in one’s resourcefulness, opens the door to inner hearing, clears chakras, and allows the conscious recognition of causes to inner and outer events. It is a stone of success, because it detangles and clarifies thoughts; increasing access to the Higher Mind and amplifying self-responsibility for thoughts and actions. Citrine emits optimistic mental energy, rejecting anything that is confusing or messy. It helps you to hold on to your money, preventing unhealthy spending habits. It is a great anti-nightmare stone for children. 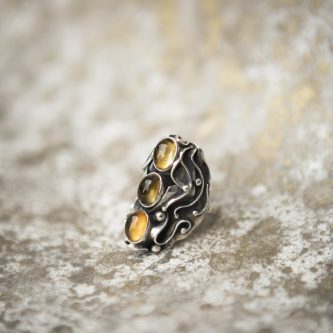 Physically, Citrine increases the elasticity of skin cells, erasing wrinkles. It relaxes nerves and muscles, encourages a healthy appetite while discouraging an unhealthy one. It heals digestion problems and clears up skin.